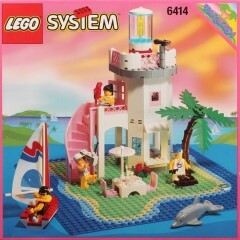 Today's random set is 6414 Dolphin Point, released in 1995. It's one of 21 Town sets produced that year. It contains 207 pieces and 4 minifigs, and its retail price was US$33. It's owned by 833 Brickset members. If you want to add it to your collection you might find it for sale at BrickLink or eBay. ^It was 25 years ago. I don't know how old you were but that's LONG ago. I remember buying this as a kid primarily for the island base and the pink stairs. $45 for two parts and a bunch of extras. Could never get the light up top to stay connected to the structure. Umbrella part would pop off and those trans curve windows would fall aside. My favourite Paradisa set of all time. I loved this set! Yes, it's very pink, but it's awesome lighthouse, on it's own little island, and it looks like the coolest little tropical vacation spot for my minifigs. Ideally, I would've added another floor (like an upstairs bedroom, or something, since presumably somebody lives on the island), but no, this was one of my favourite mid-90s sets. I want one of those dolphins. I loved this set and all of Paradisa, but I think a part of me knew that this was the start downhill for the LEGO vacation destination. Comments above have mentioned “too much pink” but for me this set was missing the distinct Paradisa pink stripe usually about five bricks high. Also that sailboat had to come from the resort next door—red and blue in Paradisa? Only on the tourists. This set gave my Paradisa so much storytelling angst though. It was the perfect spot to hide a kidnapped person with drama-filled face-offs between a hero and villain on the bridge from the stairs to the door... so many minifigures—good and bad—were pushed down those stairs! Those dolphins are weird! Every time I see one my first instinct is to say it isn't lego! I've said it before, and I'll say it again, Paradisa seems like the kinda place where Where Are My Pants Guy could finally relax and stop worrying about the location of his trousers. I think I got this set back in the day only because it featured a plate representing fries and a steak… (yes, I'm Belgian :D). The baseplate is really nice. It was a beautiful theme but, I was too young, and too foolish to understand that pink pieces didn't matter if you liked the set. An error I corrected couple of years ago with a small set. Beautiful set. I know we now have dolphins and pinky things over in Heartland City but Lego City sooo needs more like this. Perhaps if the residents could chill more at these lovely holiday resorts there would be less need for all those police stations. This was my favorite LEGO set as a child. There were stairs, and white castle wall pieces, 2x2 round tiles with printed food, and ice cream. I built so many different houses on the island base plate. Wow, the memories. I have this set in my city. Actually occupies primo real estate right at the front corner where the beach is. The pink never bothered me; I simply ways considered it beachy. Not an uncommon color near the water. LEGO City 2017 had People Pack Fun at the Beach, with a dolphin (different from Friends), swimmers and icecream. Closest to a beach scene City has been recently, but more is always good. Creator 3-in-1 had some beach houses and a nice beach scene alternate build in Cruising Adventures. Also swimmer/surfer themed figures. Also a lifeguard tower alternate build in 3-in-1 Sunshine Surfer Van set. Lego LUDO game of 2018 has 1/4th of it's area (16x16) as a beach scene. Those sets should still be available mostly but might retire soon, as some are 2017. However nowadays the color pink, restaurants, beaches, horse riding, nowadays indeed tend to occupy mostly the Friends theme instead. As for the printed baseplates, I loved them, I had 2 16x16 Pirate islands, I put next to a 16x32 blue plate from a castle set , combined with the 2 32x32 Islanders curved river plates (1 raised), and always pretended the river would flow into the sea near those 2 islands. actually a pretty great lighthouse. how many lighthouses has lego done anyway? DaftArcher20968, Too funny and true. The old CEO / president of LEGO was Kjeld Kirk Kristiansen and everyone outside the USA was obviously going KKK for short. Everyone in the USA was like 'Umm... let's not do that'. I love that nameplate, needs to come back. 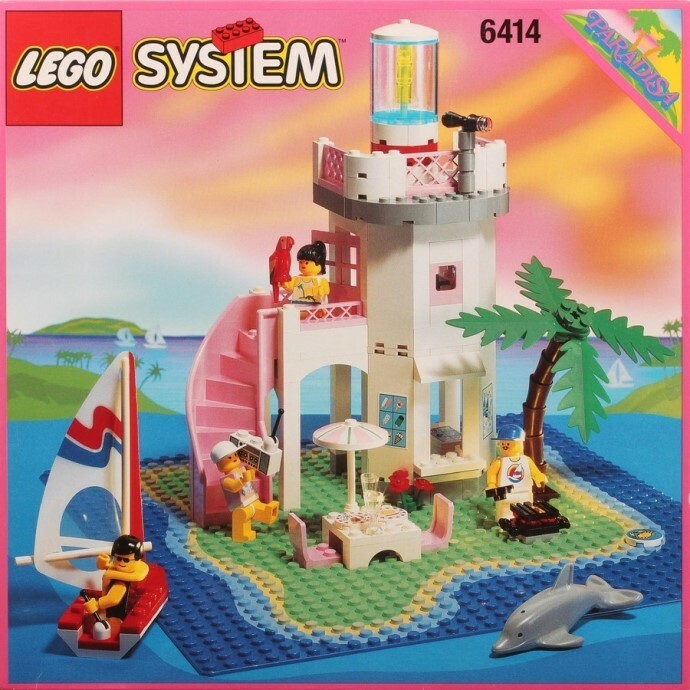 I vaaaaaaguely remember Paradisa only because a friend of mine had a couple of the sets and, at the time, I was utterly BEWILDERED to find pink parts in her Lego collection because in all the Lego I had (a modest amount) I'd never seen that colour before. Granted, I was still pretty young at the time; and it wasn't until several years later that I actually discovered the existence of the theme that used that colour. @TeriXeri most of the creator sets I have are the seaside houses and camper vans!! I didn't deliberately plan to go for beach related sets - there must be something deep inside me that wants the beach hut lifestyle (I live in a city). Ahhh Paradisa. Never got any of the sets as a kid but lusted after 6416 Poolside Paradise with the black convertible and an awesome baseplate with imbedded pool. As an adult, I found all of the Paradisa baseplates at a charity shop, and now that I have that baseplate from 6416, it just gathers dust. This is one of the 90s themes that grows on me the more I look at the sets. There is a charm and simple elegance to sets from this era - and I don't think that's just me waxing nostalgic, as I have plenty of newer sets from the last 5 years and beyond which is when I got back into it, and concurrently started working at an LBR store for most of that time period, up till a year ago today actually. Fortunately, this line isn't backbreaklingly expensive, so maybe someday. The fun at the beach dolphin is the same friends mold but with different eye printing. So is the LEGO Batman Movie Series 2 one. I miss the classic dolphin so much even though I wasn't around for it. I loved the Paradisa sets when I was a kid. I was born in Florida, and the sets reminded me of buildings I’d see by the beach whenever we visited. I can remember also when I went to Toys R Us they had big signs by the Paradisa stuff that said “JUST FOR HER!” I audibly voiced my displeasure about being told which toys were “girl” and “boy” toys, and bought a set regardless. I felt so bad for this poor child who just wanted to play with something he liked the look of. We’re never going to advance as a species. I wish Lego would still make baseplate like this. Great for pirates, or nay theme with small islands!